STAEDTLER FIMO Soft 350g Forno modellazione argilla nella carne. Carne colorata Fimo 350g argille. EAN Does not apply. Fimo Clay Texture Sheets. Staedtler plastic clay texture sheets are full of fun, creative and easy to use ways to create the perfectly and realistically textured clay. FIMO Texture Sheet For An Oriental Effect. 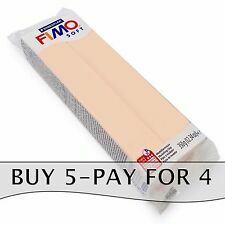 Block of 500g White Fimo Air Basic Clay. This water based clay made from 97% natural materials, hardens in the air with no baking or firing required, it is smooth, soft, easy to handle and mould (shrinkage is only 7%). Fimo Clay Texture Sheets. Staedtler plastic clay texture sheets are full of fun, creative and easy to use ways to create the perfectly and realistically textured clay. FIMO Texture Sheet For An Art Nouveau Effect. The FIMO Effect range allows for a variety of creative decorations with different finishes. 6 x 57g Clay Blocks. STAEDTLER FIMO SOFT - TROPICAL. From lush jungles to vibrant worlds, t he FIMO Soft Tropical set is a fantastic collection. of colours that can bring your FIMO creations to life! 6 x 57g Glitter Finish Blocks. STAEDTLER FIMO EFFECT - GLITTER. The FIMO Effect range allows for a variety of creative decorations with different finishes. The glitter finish set allows you to add amazing sparkle to your designs. 7 x 57g Blocchi di pietra preziosa finitura. STAEDTLER FIMO EFFECT - PIETRE DURE. La gamma di Pietre dure colori creano un affascinante effetto dual - combinando finiture trasparenti e perle. Forno indurito modellazione argilla per amatori e professionisti. Fimo Grind'n Polish Set. Fimo clay surfaces, can be easily cut to size if needed. 3 different sanding sponges for wet sanding and smoothing hardened. If the object is to be varnished, the sanding foam will prepare the surface for ideal results. 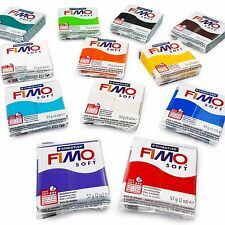 FIMO Soft is a most versatile FIMO clay, convenient to use the objects made with FIMO Soft clay are very durable and strong after baking. Oven-bake at 110°C for 30 minutes to harden permanently. The ideal beginners entry point into FIMO. The ideal beginners entry point into FIMO. Fimo is a craft product and not a toy. Super soft, oven hardening clay with easy to follow instructions. Oven-bake at 110°C/230 °F for 30 minutes to harden permanently. Fimo Oven Hardening Clay Softener Rejuvenator. It is most commonly used to soften hard or crumbly clay. It can also be used to extend deeply saturated colours. Mix Quick can also be useful when working with inclusions that might make regular clay too dry and crumbly. Fimo Soft è ideale per la famiglia. MPN 802301. EAN 4006608810900.